HEXUS has followed the Smach Z handheld PC Steam Machine saga with interest over the last few years. We first reported upon this curiously attractive machine back in August 2015 after it transitioned from its prior 'Steam Boy' moniker to the Smach Zero. At that time it was being advertised as packing an AMD embedded G-Series SoC 'Steppe Eagle' with Jaguar-based CPU and GCN-based Radeon graphics. A supporting Kickstarter project was subsequently cancelled in December of the same year for being over ambitious, before returning in August 2016 with a revamped product and Kickstarter funding plan up its sleeve. 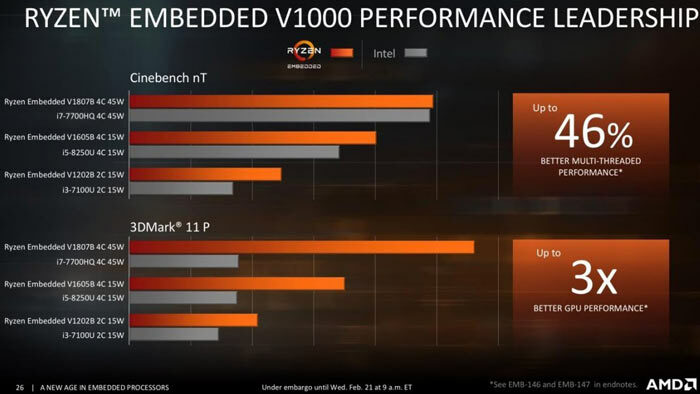 (Between those periods its touted processor spec changed to an AMD Falcon SoC with Radeon graphics plus 2GB graphics memory and it gained other refinements such as a 1080p screen). The Smach Team recently updated its Kickstarter project page with the proclamation that 2018 would be "the Smach Year". The developers will be at Embedded World, from 27th February to 1st March, where the final specs of the handheld will be announced and an Alpha version of the machine will be shown in the exhibition booth (booth 1-360, Hall 2). However, we don't have to wait until then to discover the processor family the Smach Z will use. Coinciding with the earlier news of the launch of AMD EPYC and Ryzen embedded processors today, Smach has confirmed it will be employing an AMD Ryzen Embedded V1000 in its handheld. There are four such processors being marketed by AMD and it will be interesting to see the Smach Team's choice. Liliputing reports that the processor choice from the above table will be one of the 12-25W designs. Furthermore, it will offer a similar graphical clout to the Ryzen 5 2500U laptop chip while being energy efficient enough to make the most of a portable battery pack. Smach CEO Daniel Fernandez says the system can handle "AAA titles at HD framerates, delivering desktop-quality power and graphics in the palm of players' hands". Fernandez went on to claim the Smach Z would "revolutionize the on-the-go consumer gaming experience". Thats going to a powerful handheld PC. Well, it is always a possibility that IMC on all desktop Raven Ridge is not capable of 3200 operation, whereas the embedded chips are taken from only the best dies. Is this dual channel or single channel RAM? ?